If you live in the north you've probably noted a chill in the air. The leaves are turning, the days are shortening, and anybody with a pair of skiis or a snowboard in the closet is walking with a bit of a spring in their step. 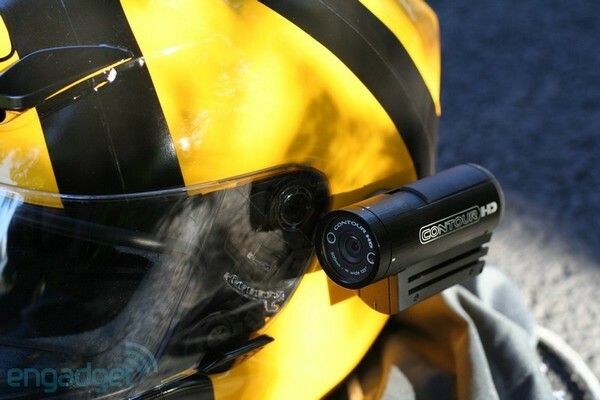 A whole new season of extreme powdery antics is just a few months away, and for those looking to capture those antics -- or those on the streets, up in the air, or anywhere else in between -- a rugged helmet camera is the way to go. Earlier this year we got a chance to run the 720p-recording ContourHD through a few helmeted trials, and now we've been given exclusive access to test the company's new version, the ContourHD1080p. The name tells you the biggest news here, full 1080p recording in a tiny package, but there's more to it than just pixels. Read on for the full details, and a video of a couple of dudes jumping off a cliff. Take the ContourHD1080p out of the package and, well, you'd be hard pressed to tell it apart from the earlier ContourHD. This is a pre-production unit and the final models will be slightly updated with a tiny 1080p graphic on the side, but the visual design is otherwise identical to the 720p model. It might have been nice to put something noticeable to differentiate it from the earlier cam (a red bezel on the front, some fender flares, maybe a giant spoiler on the rear), but we're still big fans of the sleek, sophisticated design that won't make you look like a total dweeb on the slopes. Spend a few moments playing with it, though, and you'll notice there are some subtle differences. The controls are the same, with a button on the back that's held to turn the cam on and then pressed to shut it off again, then a slider on the top that toggles recording. That slider now has a more solid feel, snapping into place when slid forward to start recording and clicking again firmly when returned backward to stop. It's a bit more re-assuring, and seemingly less likely to shut itself off should you take the sort of fall that helmet is there to protect you from. It's also very easy to turn on and off when wearing thick gloves, even when you can't see the camera -- which will probably be most of the time -- and it gives reassuringly loud beeps when it starts and stops filming, which we were able to hear even at speed on a motorcycle with ear plugs in. And, it's water-resistant, which was comforting to know when we got caught out in a rain shower. Flip open the back hatch and take a look inside and it's again very familiar; still a tiny slot for up to a 16GB microSD card, but now a slightly larger battery is wedged in beside -- 1050mAh, up from 800 -- to offer nearly 3 hours of untethered recording. Should you need more, an optional car adapter can keep you rolling as long as your whip does. Identical case design on the outside means all the same accessories from the ContourHD still work here. The default mount is still a small adhesive-backed disc that will stick onto just about any flat surface, with a Velcro-like covering on the other side allowing for quick removal. The goggle strap mount is looking to be more practical as we get closer to making first tracks, but for those with automotive pursuits in mind an optional Panavise-made suction cup mount on an articulated arm means you can securely stick this on a windshield, hood, or maybe even your forehead if you don't mind a purply mark. Finally there's a U-shaped universal mount with a standard 1/4-20-inch threaded receiver on the bottom, allowing for nearly endless mounting options. And, since the camera's internals still rotate 180 degrees independent of the exterior case, mounting on the side is no problem. Again, 1080p is the big news here, with the camera recording 30fps at a full 1920 x 1080 resolution. It can also capture 30fps at 1280 x 960, either 30 or 60 fps at 1280 x 720 (720p), and 60fps at 848 x 480. There are quite a few other things to tweak beyond resolution and frame rates, though. 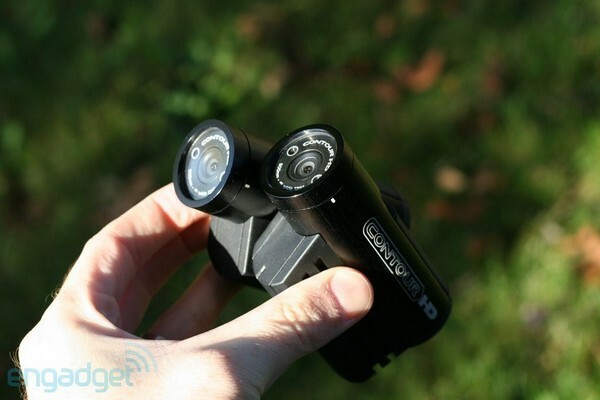 In our review of the 720p ContourHD we noted that the microphone noise was extreme when exposed to even moderate wind, and now its sensitivity can be modified to suit your speed. So too can the contrast, metering (center, average, or spot), and exposure. The cam's final software package wasn't available for our testing, but the plan is to allow tweaking of individual parameters as well as to offer pre-defined profiles, like snowboarding, car racing, or sky diving -- which we would hazard to guess entails the lowest microphone setting. We got a chance to play with the various settings and the volume leveling on the microphone helps. Unfortunately it doesn't improve the clarity of the audio (any amount of speed renders the microphone nigh-useless), but it does at least change it from a deafening roar to more of a muffled one. The results of playing with contrast are demonstrated above, showing the low and high contrast settings. In this case, on a very cloudy day, the low setting looked a bit too dark, adding an unusual purple hue to the clouds, while the "high" seemed over-boosted. The video above was filmed in the low contrast setting, which was how our camera was configured when we received it, again delivering some too-dark results on a very cloudy day. But, that's somewhat to be expected in a camera with a sensor this size, intended for capturing footage at well-lit events on sunny days. 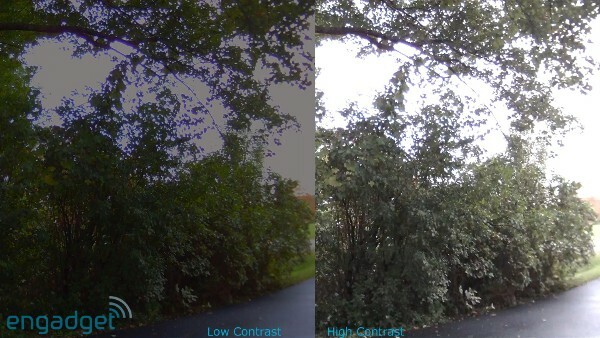 Local weather conditions conspired to give us little sun during the very limited time we had to test, but in comparing it to footage shot by the 720p ContourHD at the same time we found the older camera to be slightly darker, even. So, at the very least this is a step forward in that regard and any concerns relating to pixel density affecting light sensitivity can be safely stowed. And, test videos provided by VholdR, shot in sunnier conditions, look quite good indeed, showing vibrant colors and clear details, as you can see below. 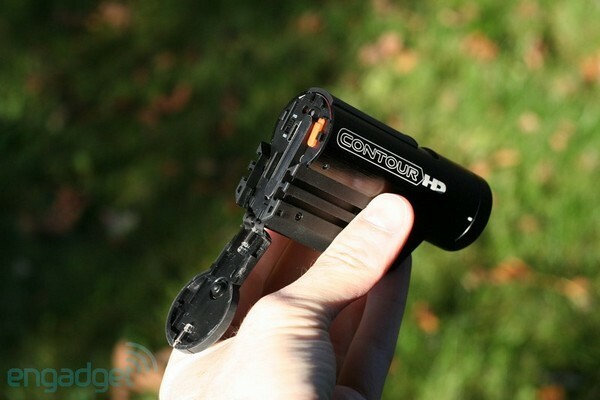 For $329.00, $50 more than the 720p ContourHD, the ContourHD1080p seems worth the premium for those looking to tickle every pixel on their LCD, or to provide some high-quality POV footage of their endeavors to their energy drink sponsors. Image quality doesn't match what you might expect from a dedicated 1080p camcorder, but we don't think you'd have much fun with one of those strapped to your lid -- nor would you really want to try given they tend to cost 3x as much. That the internal microphone here still records nothing but a woosh at speed is a disappointment, but at least we can now modulate the volume of that woosh. The 1080p is currently set for a late October release, pitting it against GoPro's $299 1080p HD Hero Wide, which looks set ship about the same time. It's too early to know how the two will compare directly, but we can already say we prefer the streamlined form-factor of the ContourHD. As to how they stack up otherwise we'll just have to wait until we can try them head-to-head, something we hope to do in the not-too-distant future.